The Sidney Hillman Foundation announced the creation of the George Barrett Award in 2015, named in honor of the crusading Nashville attorney, well-known for his role in the civil rights and labor movements and other important social causes. The George Barrett Award is given to an attorney whose work exemplifies the public spirit of “Citizen Barrett” and the causes he supported over six decades of advocacy. The George Barrett Award complements the Hillman Foundation’s famed Hillman Prizes, awarded each year since 1950 for journalism in the public interest, and the Sol Stetin Award for Labor History named after Sol Stetin, the president of the Textile Workers Union of America. 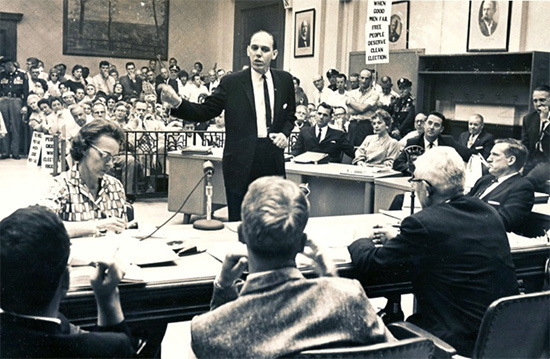 George Barrett, who died in 2014 at the age of 86, was one of Nashville’s most prominent attorneys and spent much of his career defending civil rights activists, anti-war protesters, and labor organizers. He also defended death row inmates and prosecuted lawsuits against public companies accused of cheating investors. One of his biggest cases was Geier v. Tennessee, a higher education desegregation lawsuit that lasted more than 30 years and eventually ended the last vestiges of legal segregation in the South. Nominations will be made by a panel of attorneys including George Barrett’s daughter, Mary Brewer, an attorney with the U.S. Department of Housing and Urban Development; David Prouty, General Counsel, SEIU 32BJ; Wilma B. Liebman, former Chairman of the National Labor Relations Board; Nicole Berner, General Counsel of the Service Employees International Union (SEIU); Peter Ward, Senior Counsel and labor and civil rights advocate in the Republic of Ireland; and Daniel J. Ratner, General Counsel of 1199SEIU.